There are few things more satisfying than the act of peeling something off — be it the thin layer of cellophane on a new piece of tech, the rind from an orange, or — I’ll admit it — old gel polish from a nail. But while forcibly shucking your polish is (indisputably) a terrible idea, shelling your skincare might actually function in your favor. 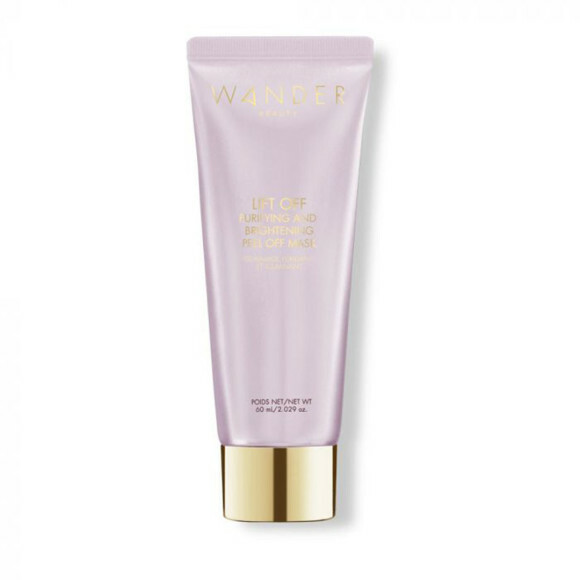 Consider the new Wander Beauty Lift Off Purifying & Brightening Peel Off Mask ($34). If you’re familiar with the travel-centric brand, you’ll appreciate the plane pun. You’ll also know that this is Wander’s first peel-off mask, and one of only two in its curated collection (the other, Extended Stay, is a lotion-like hydrating mask). Like most Wander products, the entirety of this mask lives within a pinky-purple color scheme. The packaging features a combination of lilac and gold. Initially, the svelte tube led me to believe that the formula itself would be equally as ethereal-looking — but, surprise!, the mask itself is actually a ravishing, pearlescent plum color. Add that to the fact that you need to literally peel this stuff away from your face to remove it, and you have yourself the perfect storm for a mask made for Instagram. But rest assured: Lift Off is more than a just a pretty facade. Rather, it’s packed with skin-protecting antioxidants from berries (and smells like a bowl of fruit, too). In addition to protecting from skin-aging free-radicals, this mask also purifies by functioning as sort of a Bioré pore strip for your entire face (albeit on a much less intense scale). I can honestly say that my face looks brighter — more well-rested, even — post use. Moreover, my “new” skin feels supremely primed and ready for whatever serum, moisturizer, or sheet mask I want to put on afterwards. The Lift Off Mask takes “saving the best for last” in the most literal way possible. The removal is intensely satisfying — which is something I’ve never been able to say about a face mask, I might add. Not only does it peel off in a single satisfying sheet or two, but it doesn’t stick in your hair or muddy up your sink in the process. In fact, there’s no water required. I think I’ll be throwing this in my travel skincare kit next time I fly — er, Lift Off.